efore there was Black Lives Matter, there was another sweeping social movement led by Afri­can-Americans. 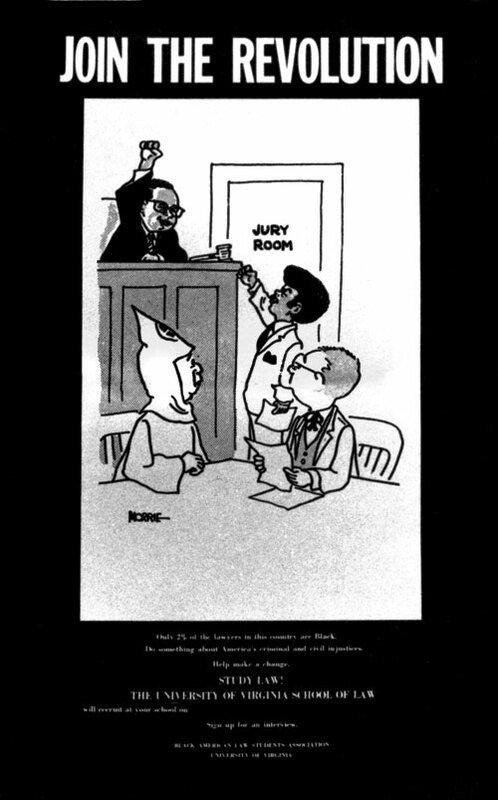 The movement’s aim — as the civil rights era matured and the 1970s approached — was to recruit, train and promote black attorneys within the legal establishment in the interest of greater opportunity and justice for all. At law schools, the Black American Law Students Associa­tion was at the forefront of that movement. Students at UVA Law organized the school’s BALSA chapter on Friday, Oct. 16, 1970 — two years after the original chapter began at New York University and following the establishment of chapters at other major law schools. A BALSA poster designed to recruit UVA Law students said: "Only 2% of the lawyers in this country and Black. Do something about America's criminal and civil injustices. Help make a change. STUDY LAW!" Eschewing a top-down approach for a more egalitarian style, the students elected Albert L. “Skip” Preston ’71 as their “convener,” rather than president. In addition, Gloria H. Bouldin ’73 was chosen as secretary, with Class of 1972 members Gwendolyn L. Jones, S. Delacy Stith, Jack W. Gravely, Bobby N. Vassar and Leonard McCants selected as committee chairs. Numbers were the group’s most pressing concern. Among the Class of 1970, there were only two black students. (Elaine Jones and James “Jimmy” Benton graduated that spring.) The incoming class for the 1969-70 academic year in­cluded a group of 13 black students. Both in law schools and in the legal profession, blacks were thought to have had about 1 percent representation, despite their much higher numbers in the greater population. On the UVA law faculty, there were no black professors. By the fall, the faculty’s appointments committee acknowledged the hiring problem, and set recruiting the first black professor as a goal — albeit one that seemed without a timeline. 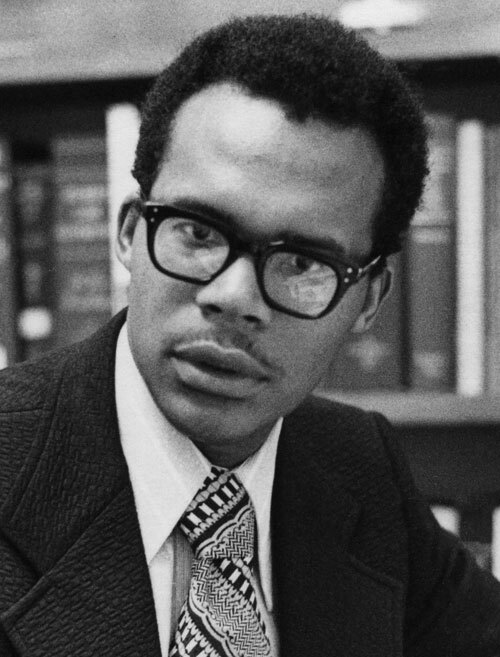 In 1971, publicist McCants and fellow third-year Norman Davidson, a white student and president of the law student council, formed an ad hoc committee for the recruitment of black professors. At the time, there were two black lecturers, who were not part of the full-time faculty. They each served only the duration of their courses, one semester. The article indicated that part of the problem was that the hiring committee was reaching out to their peers among top law schools, where there was al­ready a shortage of black professors. Still other potential candidates felt ill-at-ease in the South, according to Associate Professor Jerry L. Mashaw, who chaired the subcommittee on minority recruitment. “Professor Mashaw said that one highly desirable candidate stated outright that Washing­ton, D.C., was as far south as he would go,” the article read. BALSA had presented the hiring committee with a list of 50 potential professors who the group felt were qualified to teach various sub­jects; many of them were not contacted, Vassar told the Weekly. It also called for a moratorium on hires until a black faculty member was chosen. Through student council, BALSA had demanded the addition of qualified black faculty by the fol­lowing September, leaving the Law School com­munity to wonder what action they might take if their demand wasn’t met. The hiring of black faculty continued to be spotty as the years progressed. 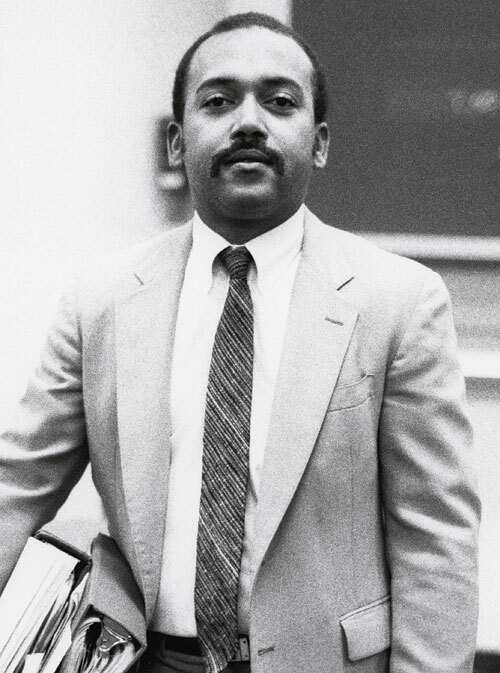 After Thompson’s departure, it took two years for UVA Law to hire a black full-time professor again, with the addition of Professor Alex Johnson in 1983. Growth in black law student numbers at UVA Law also came more slowly than BALSA would have wished. But BALSA continued to reach out to black prospec­tive students as part of annual recruiting efforts, and remained outspoken about student and faculty representation. In 1983, National BALSA removed the “American” from its name to be inclusive of black members who are not of American nationality. That change is reflected in the current UVA BLSA, an award-winning chapter that has operated at the Law School for almost 50 years. Bobby Vassar '72, middle, speaks at a press conference called by BALSA. To the left and right of Vassar are Margaret Poles Spencer '72 and Leonard McCants '72. Everything had to be perfect if the March 23, 1972, press conference in Clark Hall was to have its intended effect. Not only did BALSA have the ears of state and federal organizations that dealt with dis­crimination, to whom they were sending their letters of complaint, but they also had the eyes of the news media, some of it national. “We understood there was boldness and some audacity, but that was how you did things back then,” Vassar said. He didn’t recall much nervousness among the group as they challenged the administration, however. The press conference took place on a Tues­day afternoon. “The next day, Wednesday, Professor Gib­son from Baltimore, who had taught a course at the Law School, was on the campus and came by to see us to tell us he was offered a job starting the next semester,” Vassar said. Vassar went on to become a public interest lawyer. His career spanned from being a legal aid attorney in Roanoke, Virginia, just after graduation, to recently retiring as Democratic chief counsel for the Subcommittee on Crime, Terrorism and Homeland Security of the U.S. House Judiciary Committee. He continues to work part-time as senior counselor for Bay Aging, a Virginia Area Agency on Aging, and volunteers as a member of numerous government and nonprofit boards and commissions.